In 1946, the Cleveland Rams moved to Los Angeles, still a nascent sports town then. The team wanted to play in the publicly owned Los Angeles Memorial Coliseum, but black taxpayers had paid for the stadium’s construction like everyone else. And there were no black players in the NFL. Local black sportswriters saw an opportunity. Halley Harding of The Los Angeles Tribune led a group urging the Coliseum Commission to deny use of the stadium to any organization discriminating against blacks. During a meeting with the commission, Harding trumpeted former UCLA star Kenny Washington as a hometown hero, while reminding everyone of the sacrifices of black soldiers in World War II. He convinced the commission’s president to sign a resolution guaranteeing integration. Soon after, Harding persuaded Rams general manager to sign Washington — a year before Jackie Robinson broke baseball’s color barrier with the Brooklyn Dodgers. “Black newspapers claimed a major barrier had fallen in pro sports. White dailies emphasized that Washington’s signing in no way set a precedent for the hiring of other African Americans,” Gretchen Atwood writes in her chronicle of the NFL’s integration, Lost Champions. 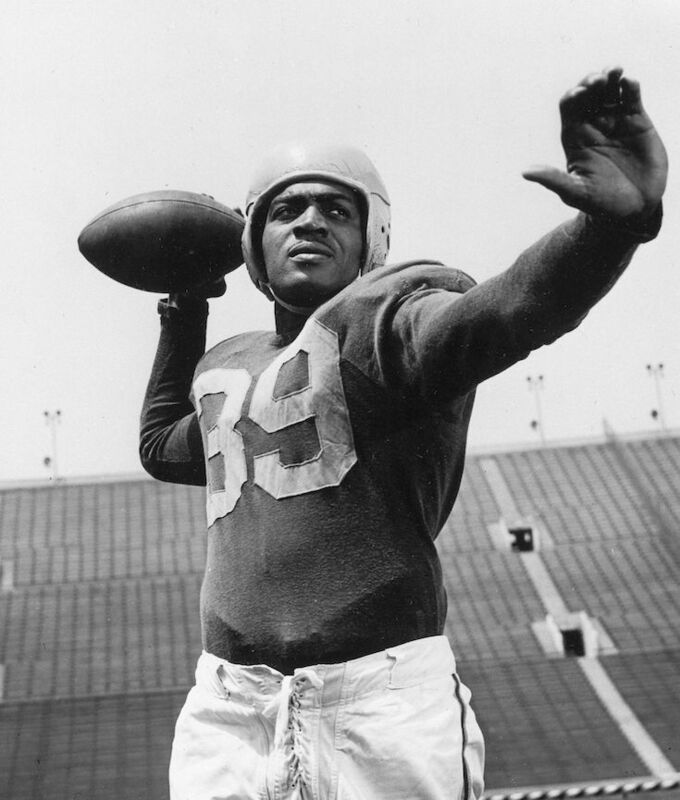 “He’s a great football player and Los Angeles will make a lot of money with him in the lineup,” Robinson told the Pittsburgh Courier about Washington’s signing with the Los Angeles Rams in 1946. “People will come from far and near to see him play.” Robinson would know — the two had been football teammates at UCLA.